Last week I was summoned to appear in court as a witness. I’m more than prepared to do my civic duty, being from the less salubrious part of Essex, I am quite obviously a steadfast advocate where it comes to upholding the law…but sadly this call from lady justice proved to be a right royal pain in the arse. Let me explain. Now that I reside in Bristol, rather than Essex – London is now well over two hours away. Getting to Camberwell Green court for 9am, when there’s a tube strike on (not that it mattered much, South London being notoriously ill served by underground services), meant that I (and ‘E’ she’d kindly decided to accompany me for moral support) had to get up at 4am! Nevertheless, we did it. I burst through the doors and strode into court, on time, with fists clenched and my jaw set in grim determination rehearsing my dramatic “You can’t handle the truth!” line only to be stopped dead in my tracks. The wheels of justice had pretty much fallen off already. The case was being ditched due to a ‘technicality’ and my services were no longer needed. 10am, a gorgeous sunny autumnal day in London. What to do to salvage something from this disaster? Stuff our faces and get roaring drunk perhaps? Yes indeed, that sounds like inspired thinking! 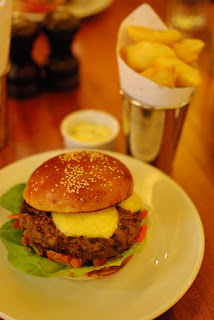 Being a massive fan of the original Hawksmoor in Commercial Street, and an even bigger fan of their incredible burger, the lure of the newly opened restaurant in Covent Garden was strong. A few phone calls later, and we were all set for lunch. Wandering into the reception area and then downstairs, the size of the new restaurant compared to the original is nothing but impressive. The whole place is decked out in wood panelling, there’s a distinct Victorian gentleman’s club vibe to the interior. It’s dark and cosy, and looks like it’s been in existence for decades rather than weeks. A beautifully appointed bar runs one whole length of the room, and then the main restaurant proper was just visible through some doors at one end. Obviously a visionary, I am often lacking steam and energy before 11am and can obviously appreciate the need for such drinks. We relaxed and took in the atmosphere. I sipped on a pretty decent ‘Marmalade cocktail’ whilst ‘E’ being something of a sherry fiend knocked back a ‘sherry cobbler’ Until we were joined by our lunch companion Niamh and ready to wade into the food. Huzzah! I’ll say it right now; bearing in mind how bloody amazing the original Hawksmoor burger is, there was really only one real choice for me from the menu – the kimchi burger. Kimchi, in case you’re not aware (I wasn’t) is a Korean dish of fermented cabbage mixed with various spices. We were told one of the Hawksmoor chefs had tried it whilst travelling, and brought the idea back with him. Inspired. 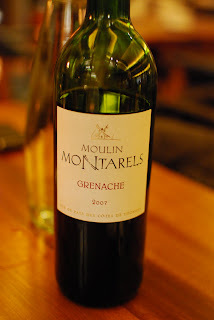 I don’t often write about the wine I drink, but in this case the Moulin Montarels Grenache deserves a mention as it was bloody gorgeous and at £19 a bottle ridiculously cheap, a perfect accompaniment to a long boozy lunch. It was with mounting excitement that I eyed each plate of food being transported from the kitchen, luckily I had sedated myself heavily with booze and vino otherwise I would have been barely able to contain myself when our food finally arrived. There we have it in all its glory, the kimchi burger – using the incredible Hawksmoor burger as its base, I admired it from every angle. But what was that smell? A kind of cheesy, funky tangy whiff hung heavily in the air. Looking up, I eyed ‘E’ and Niamh suspiciously and then slowly I realised. The smell was emanating from my burger. I wrinkled my nose and surmised that kimchi smells a bit like sweaty socks. Not that appetizing, but as I was paying £15 for the privilege, and I’d drank a fair bit of booze It would have to smell a hell of a lot worse than that to stop me from tucking in. Proving that smell is absolutely no indication of how good something actually tastes. I found happily that the kimchi burger is bloody gorgeous, rich, spicy, and tangy with a bit of a chili whack – it really is an incredibly flavored thing. I liked it so much, after stuffing mine I ate Niamh’s leftovers. Cracking. Paired with beef dripping chips and béarnaise, I was the proverbial dog with two dicks. 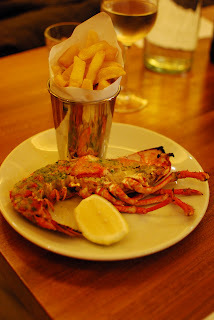 Meanwhile, ‘E’ being the problematic pescetarian that she is was tucking into half a lobster with triple cooked chips and béarnaise and judging by the rapidly growing graveyard of lobster bits and bobs being assembled at the side of the plate, really enjoying it. We sat, chatted, laughed and ordered more wine, and then more wine and then finally staggered back to the bar to order more cocktails. We’d lost all track of time when ‘E’s good friend Petra joined us. Not a big fan of this, it tasted like toothpaste. These were bloody nice, really good. A recommendation from the barman when asked for a refreshing drink – it certainly was. 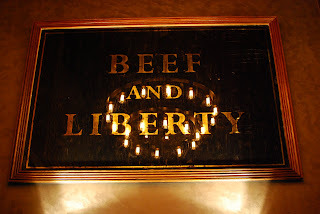 Ahhhh a classic – and Hawksmoor’s version is incredible – loved this!!! Rye, Vermouth, Maraschino, Cane Syrup, Angostura Bitters & a dash of Absinthe between them, which came up beautifully presented on a silver platter and was as far as I could tell, exemplary. At this point we realized it was almost 8pm, we’d been in Hawksmoor for over seven hours (Now that’s what I call a lunch) and ‘E’ and I had to run to make our carriage back to Bristol. Bearing in mind we were both utterly spannered, it’s amazing we made it up the stairs let alone back to Bristol. Drawing a curtain over this tawdry, alcoholic end to the evening. Lets have a conclusion…. The new Covent Garden Hawksmoor restaurant is fantastic. The cocktail menu and bar is top drawer, really interesting and its a cracking place to while away an afternoon or evening drinking unusual concoctions. the kimchi burger, despite smelling a bit ripe is bloody incredible, so much so I almost ordered a second one later in the evening. 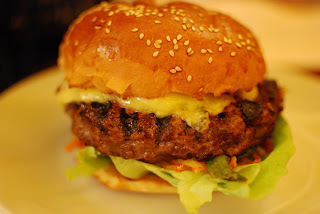 Hawksmoor’s original burger is in my opinion probably the best you can eat in London – I can’t give higher praise than saying that the kimchi burger is equally as good. Good Morning to all of you. The beautiful, intelligent and amazing people who no doubt make up the readership of my blog. I know that lately, it seems that all my spare time has been taken up with ‘The Basement’ supper club and as such; I just haven’t had the chance to write about the restaurants I’ve been eating at. I want to share, I really do – but I just seem to spend my time running around like a headless chicken. But suddenly, what’s this? A free day to fall out of bed, lazily scratch my generously proportioned genitalia*, yawn, and then slouch around in my pants like the slovenly bum I am, drinking tea and generally doing whatever the hell takes my fancy? Today is that day friends. 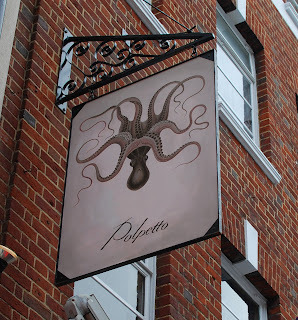 And I’m going to write about Polpetto, (Baby octopus) the newish (Opened end of August) tiny offshoot of the extremely successful and significantly larger Soho restaurant Polpo (Octopus). Ahhhh see what they did there? Clever. 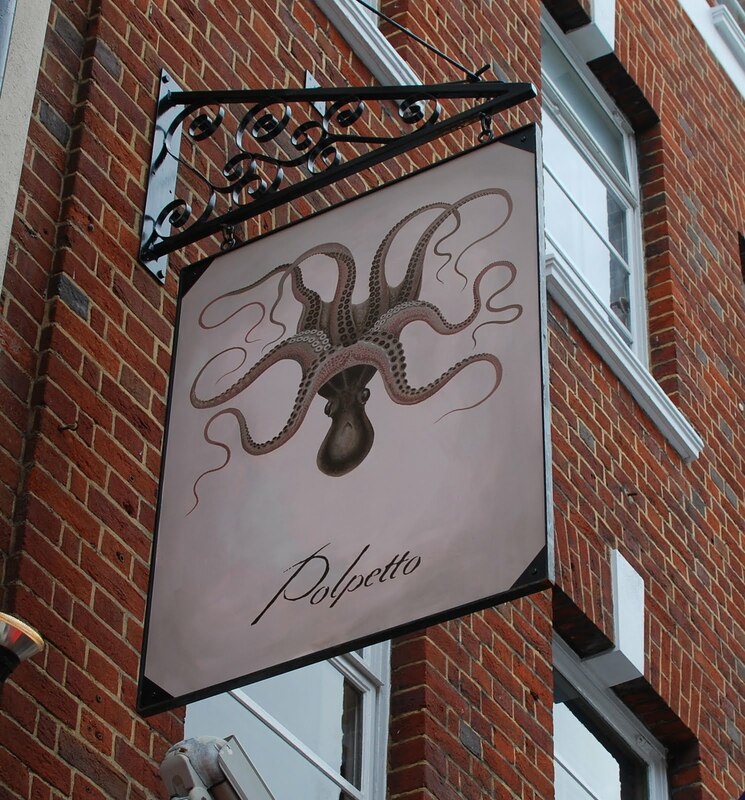 Polpetto follows the same format as its older, more established parent, in that it’s modelled on a Venetian ‘Bacaro’ a type of working mans pub, specific to Venice where small plates of snacks, known as Cicheti are served. It also shares the same rather fantastic interior design, which is a kind of semi industrial, shabby, 1930’s New York chic. It’s very nicely done, and creates just the right kind of furtive atmosphere I like when I’m dining. Mark me down as a fan. So that’s the similarities covered, what about the differences? Polpo isn’t a massive space but compared to its baby offshoot, it feels cavernous. 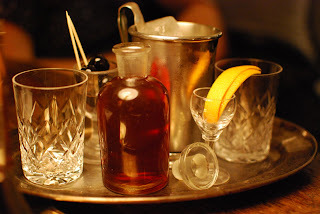 Unusually for a restaurant, Polpetto inhabits a single room above The French House pub in Soho. It probably seats no more than 20 – 25 diners. Access is by a side door, with a brief glimpse of the busy pub bar, as you climb up a few flights of stairs, through a doorway to the dining room. All of this adds something to the almost speakeasy atmosphere, a hidden back room restaurant only frequented by those in the know, rather than the Soho media darlings, movers and shakers who were in evidence on the lunchtime ‘E’ and I visited. (OK, if you simply MUST know we were sitting between the celebrated author Sebastian Faulks on one side and the finance director of Hakkasan on the other. It goes without saying that ‘E’ and I had no idea who they were until it was pointed out to us later). Another major difference is that, unlike Polpo at lunchtime the dining room is flooded with light from the large windows running one whole length of the room. With the lively hustle and bustle of Dean Street just outside, on a nice sunny day this gives the room an extremely airy and open feel, which goes some way to detract from the diminutive proportions of the restaurant. Enough about the interior design and the atmosphere lets get on and talk about the food! 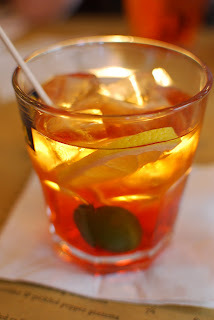 First, and most importantly some alcohol – we both ordered a spritz with Aperol to sip on whilst we perused the menu. This is a sophisticated drink for sophisticated people. I was of course, in my element. 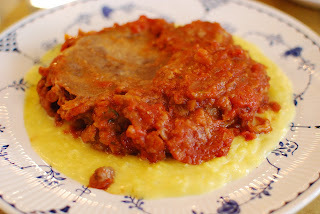 ‘E’ and I decided to mostly bypass the Cicheti, not wanting to be detracted from the main dishes. 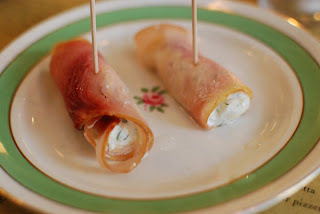 But, we just couldn’t resist a nibble of smoked swordfish with lemon and dill ricotta. I found it pleasant enough, the contrasting flavours of the smoked fish against the light, herby lemony tang of the filling worked well, but I think the ricotta filling was perhaps too cold dulling the taste somewhat. Moving on, we ordered a selection of side dishes to share. 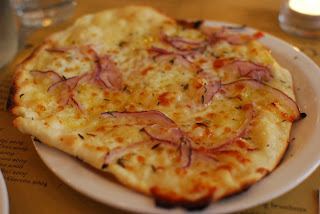 A portion of really superb crispy based Pizzeta Bianca with a delcious, slightly gooey, onion and cheese topping. 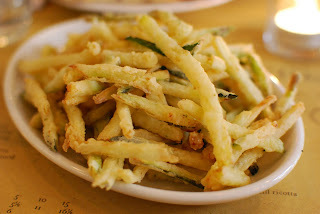 A bowl of some rather nice shoestring zucchini fries. 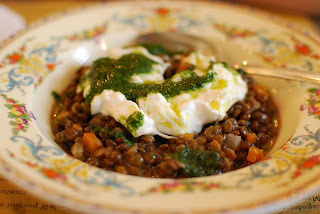 And, a standout dish of warm lentils with basil, topped with a mound of Burrata (A soft Italian speciality cheese similar to mozzarella, but much more creamy and delicate). This was bloody delicious, both ‘E’ and I liked it a lot. As a main, I’d ordered Osso Buco with saffron risotto and despite being unlucky enough to get a veal shank that was solid bone with no marrow to speak of, it was frigging superb, The rich velvety meaty texture of veal against the creamy perfectly cooked saffron risotto was just out of this world. 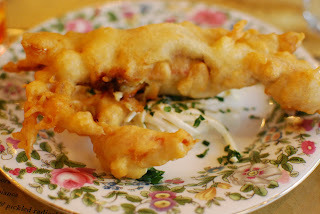 ‘E’ had chosen the soft shell crab in Parmesan batter with celeriac slaw, and despite it being perhaps a less aesthetically pleasing plate to look at than some of the previous dishes we’d ordered, what little I got to nibble on tasted impressive. ‘E’ devoured it greedily and gave it the thumbs up. 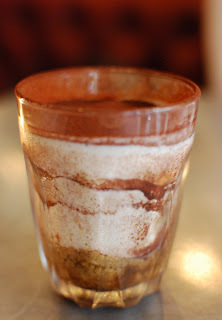 By this stage we were absolutely stuffed silly, but still managed to fit in a nice little glass of tiramisu to share. I absolutely love Polpetto. It has a wonderful buzzing atmosphere with an artfully decrepit yet secretive vibe and outstanding rustic food. What more could you want? As with Polpo there’s a no booking policy for dinner, but you can book for lunch. Go!!! * I just HAVE to say that - them's the rules, I don't make em. Fame at the Basement!! (And our 2nd Supper). The dining room is darkened. Silence. The sudden low electrical hum as a spotlight suddenly appears in the centre of the floor, dust pirouettes lazily in the glow. An appreciative gasp from the audience as I stride into the limelight, contemptuous of the stir I've just caused. I strike a pose, and hold it. Clad head to toe in a body hugging black Lycra catsuit, my athletic dancer outline broken only by my leg warmers and the stick I use to beat on the floor for emphasis as I spit out "Fame costs, and right here is where you start paying"...I strike a 'jazz hands' position. The audience gasps, then hushed silence as strange rhythmic music, played on a bongo begins to drift out of the darkness. Not the 1980's TV Show 'Fame'! The fame that comes from having a recipe from Montpelier Basement featured in Xanthe Clay's column in The Telegraph. 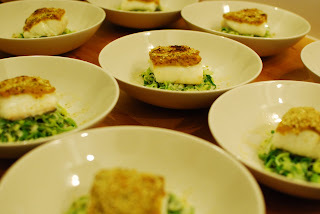 And, if that wasn't enough, Fiona Beckett the new Guardian wine columnist (and food writer) coming to our second supper and giving us a stonking write up on her blog, kind of fame! To say 'E' and I are chuffed silly would be a complete understatement. Cheesy grins, high-fives and backslaps all round. Although, not quite as good as me dancing gracefully in a body hugging leotard I think you'll all agree, but it's up there.... it’s certainly up there. As you can see, the final menu featured pumpkin in every course (as it was Halloween...err...almost), but it was all quite subtle. The Montpelier Basement - Saturday 30th October. 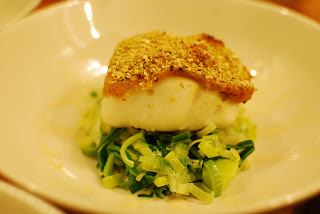 Baked Cornish haddock with pumpkin crust, leeks and white wine sauce. Quite an adventurous menu I'd say, given that we only have a domestic kitchen to crank it all out from. We had all eleven guests seated at one table stretching the length of the room, rather than split up onto separate tables. The problem with this arrangement is how to get eleven plates of food out all at once, and all hot with only limited hob and oven space. But with careful planning, flow charts, pie charts, spreadsheets and a white board, 'E' managed to drill into my dense skull exactly how this could be achieved. But more about that later. 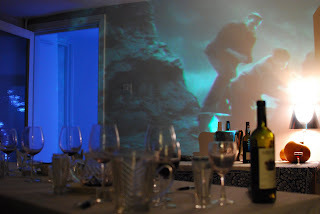 Before our guests arrived, we'd laid the table, lit the wood fire which was roaring away, throwing a nice warm flicker around the room, lit the candles and finally - as it was Halloween (well almost) we'd borrowed a projector and had old black and white horror films playing on one of the dining room walls. 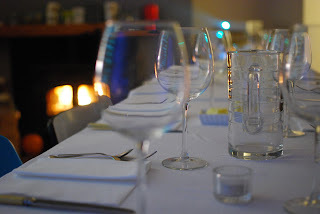 It worked really well and added a really superb atmosphere to the dining room. 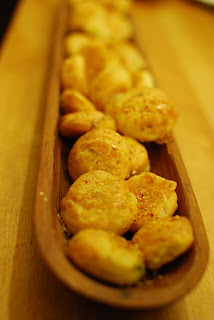 First up - the Gorwydd Caerphilly, thyme, chilli and pumpkin dust gougère, which we served as nibbles with sherry. The basic gougère recipe I've blogged before here, but we substituted Caerphilly for Cheddar, added some Thyme and dusted with chilli flakes and blitzed toasted pumpkin seeds. 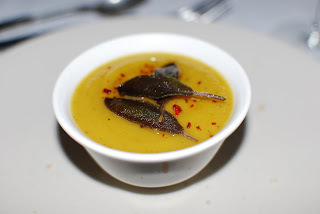 After some beautiful Bertinet rye bread, we served a small portion of pumpkin and sage soup ('E' now has her own blog, and has helpfully put the recipe up here). We decorated this with chilli flakes and deep fried sage leaves . Next, we were both especially pleased with the baked Cornish haddock with pumpkin crust, leeks and white wine sauce. It looked really elegant and tasted incredible (we made an extra portion for ourselves). It was actually a bastardised Gary Rhodes recipe from my old favourite 'New British Classics'. He uses Halibut and serves it in much bigger portions. 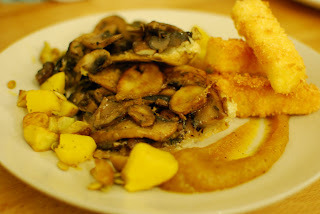 We had one vegetarian diner, and 'E' had made them a superb Mushroom and Old Demdike tatin with thyme, chestnuts and squash. We'd used a mixture of chestnut mushrooms, Portobello and for added luxury (it was an alternative to steak after all) sliced fresh ceps. This was layered through with Old Demdike cheese and thyme. We served it with the same pumpkin jam (Made the previous night) and polenta chips that we served with the Onglet. The steak presented us with something of a problem. How to cook eleven massive slabs of Onglet, and then rest them.... to serve all at the same time, hot with only four hobs. Helpfully, the head chef at Source Food Hall & Cafe presented the solution to us. Pre-sear the Onglet first, and then whack all of it on a baking tray, covered with foil into the oven and cook until medium rare. A technique that worked beautifully. (Source incidentally supplied us with both the freshest Cornish Haddock, as well as the superb Onglet and Ceps). Unfortunately, not everything was as easily worked around. The Polenta chips that we served with the onglet were a hell of a lot of work to flour, egg, and coat in panko then fry in small batches. But with head's down and working methodically we ploughed through it. 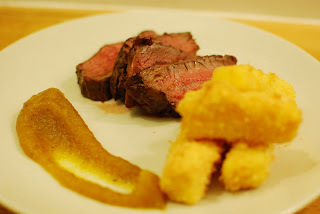 With the polenta chips fried, me frantically slicing the now rested steak and 'E' artistically smearing the plates with pumpkin jam and plating up, we managed to get the hardest course out. High Five! 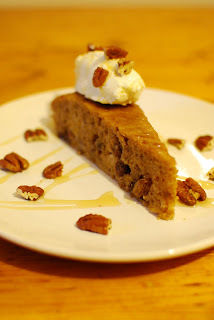 Breathing a sigh of relief, and knocking back a celebratory glass of red we plated up the beautifully moist Spiced pumpkin and pecan cake with mascarpone, honey and toasted pecans which 'E' has made the previous evening (recipe here). I drizzled with honey and artistically scattered toasted pecans whilst 'E' expertly shaped the mascarpone quenelles. Pudding served we left the confines of the kitchen to sit with our guests, drink as much booze as we could lay our hands on and generally relax a bit and enjoy the atmosphere, with just a brief visit back to the grill to make the final course of Rarebit. Everything, (surprisingly) had gone extremely smoothly, no tourette like streams of swearing, no panicked shouting and no screams, all of which have so often been the hallmarks of my dinner parties. Just fairly calm hustle in the kitchen. With the majority of our guests waving unsteady goodbyes at around 1:30am, 'E' and I declared the second supper a bloody good evening, left the mess to clear up in the morning and crawled drunkenly upstairs to bed. We have at least two more dates planned for 2010, the 13th November and 27th November. (And possibly one more date in early December).